Last year we saw the launch of Intel’s latest mainstream processors using the Skylake microarchitecture, and we’re still a few months away from the Kaby Lake update to the platform with 200-series motherboards. On the high-end desktop side, Intel has very recently launched the Broadwell-E line of CPUs, including the 10-core Core i7-6950X at $1723 (read our review here); however this new line of CPUs uses the LGA2011-v3 socket similar to the previous generation of Haswell-E processors. Keeping the same socket for two generations has been a long-term Intel strategy, so no surprises there. This means that the chipsets also stay the same, and we stay on the X99 chipset for a second generation. Normally in this instance we see the motherboard manufacturers release updated models on the same chipset, adjusting the style and feature-set depending on the market. 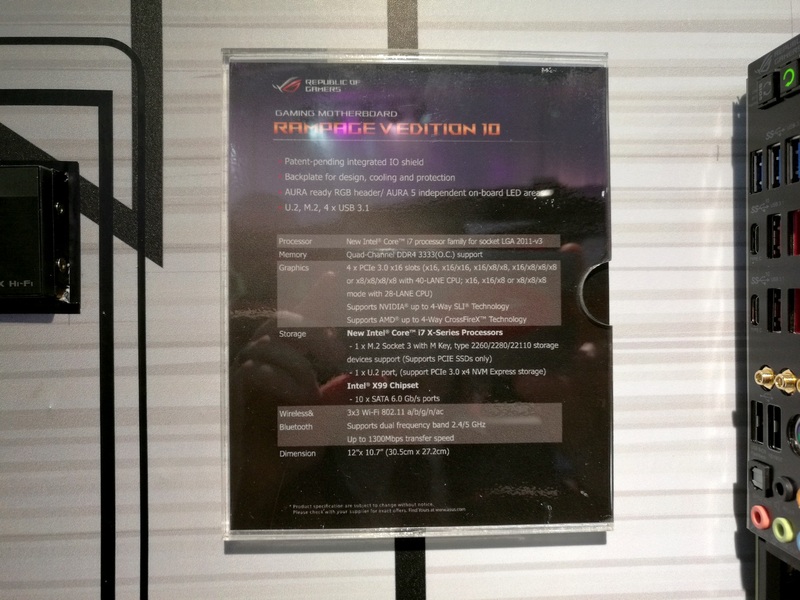 The key points for the refresh models across all the manufacturers so far has been the increased adoption of U.2 ports, but as ASUS is in the middle of their 10 Year ROG anniversary, to celebrate the occasion they have released a special version of the high-end Rampage V Extreme (RVE) motherboard, normally a $500 model which reviewed earlier this year, into a Rampage V Edition-10 for $600. 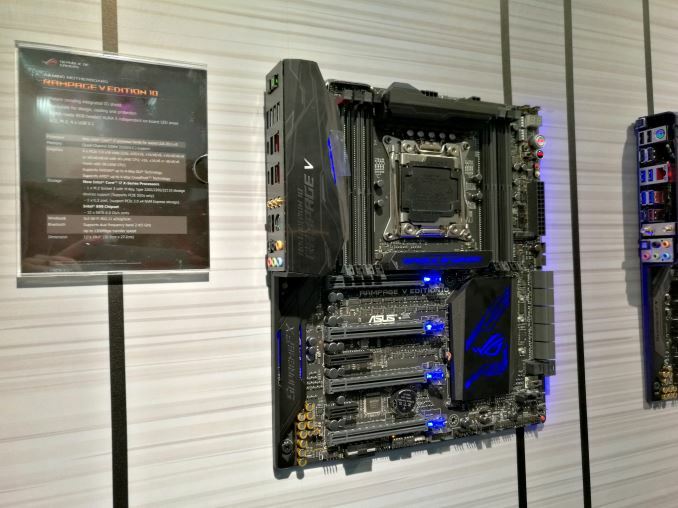 There’s also a nod to the RGB LED craze that seems to be sweeping the gaming motherboard line, in new models such as the Strix X99 Gaming. If we cycle back to the launch of Sandy Bridge-E, and the X79 chipset, the best-selling motherboard of that generation was the ASUS X79 Rampage IV Extreme: a high-cost motherboard that ultimately focused on overclocking and gaming. It was part of a trio of X79 Rampage motherboards, which also included the gaming-focused Rampage IV Formula and the micro-ATX Rampage IV Gene. 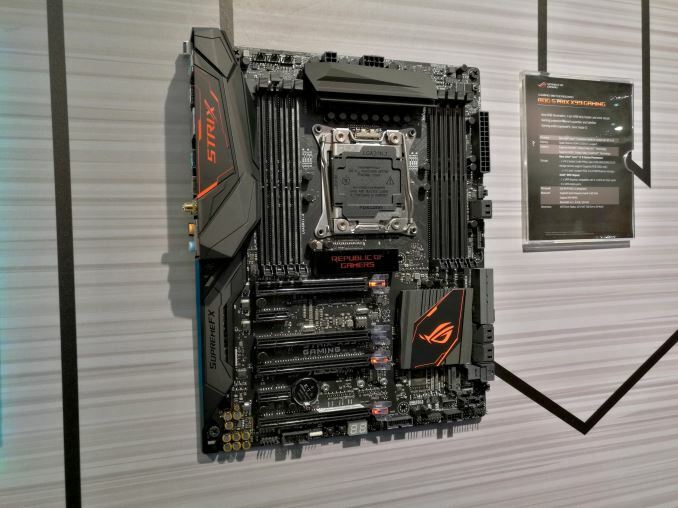 We reviewed all three in a big ROG article when they were launched, and ASUS has tried to match this success with the X99 platform and the Rampage V Extreme. Similar to how the Rampage IV Extreme had a refresh model, the Rampage IV Black Edition, the RVE gets one for the 10-year anniversary. The most obvious change to the Rampage V Edition 10 is the PCIe slots. Instead of lighting up an LED beside the PCIe slot that needs the graphics card, ASUS has moved to a semi-transparent PCIe latch with an LED underneath that uses a microcontroller for various lighting effects. There are going to be a number of motherboards with this coming in the near future, but the blue lighting here is for the Edition 10. Compared to the original RVE, the black design is reminiscent of the Rampage IV Black Edition, but there are also a few more updates. ASUS removed the SATA Express ports in the SATA area, and replaced them with a U.2 port that supports PCIe 3.0 x4 drives, like Intel’s SSD 750. The rear panel protector, designed to enhance the aesthetic, is now placed down the side of the motherboard covering most of the audio pathways, although a few filter caps are moved to outside the guard. Also on the list is the middle PCIe 3.0 x4 slot, which on the original RVE was a full length PCIe 3.0 x4 slot, but here is reduced to an open ended PCIe 3.0 x4 slot. I suspect there will be a few more changes, particularly with Broadwell-E, such as the addition of a second 4-pin DIP switch system on the top right of the board, however if we get the board in to test we’ll go in deeper. The Rampage V Edition 10 is already on sale, coming in at $600. The Strix brand at ASUS is having an interesting time. It was originally released on certain graphics cards to signify silent operation, and use the eagle eyes logo to come across as ‘silent but deadly’. Since then, the Strix name has been moved from low-noise to a general ‘value’ proposition model line, pitching behind some of the more well-known ASUS brands. 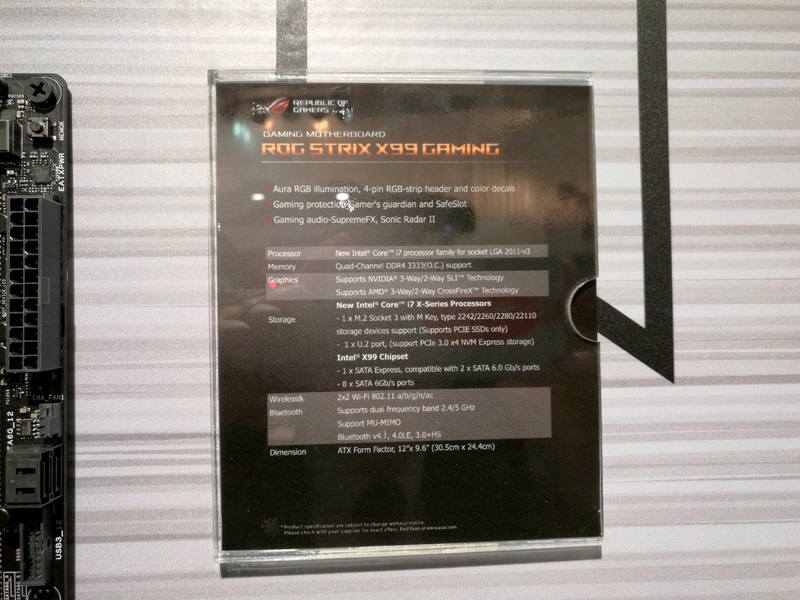 In this case, Strix is meant to signify a fully featured but slightly different to ROG gaming brand with a lot of features but not necessarily ROG branded. I would assume that means that Strix gets a different software package, which might reduce the cost over ROG. The Strix board as shown above looks like a hefty X99 motherboard, using a full array of DIMMs, support for three proper graphics cards, a rear IO/audio combination plate, both SATA Express and U.2 support and multiple fan headers. If only faintly, you can also tell that this model also has the transparent PCIe slot latches similar to the Edition 10, this time in a red/orange color. The Strix is aimed at 2/3-way high-end desktop systems, and will offer full ‘Aura’ RGB illumination with a separate RGB strip header for a bundled RGB strip to be used with software. It will have a few gaming tools similar to ROG, including Sonic Radar II. The Strix X99 Gaming current retails for around $340.